Halcón plans on spending ~$380 million in its East Texas Eagle Ford acreage (El Halcón) in 2014. That's approximately 40% of the company's budget. At the end of February, 2014, there were 45 Eagle Ford wells producing, 10 wells completing or waiting on completion, and 4 wells being drilled. 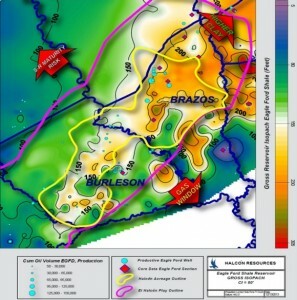 Halcón currently has working interests in approximately 100,000 net acres tied to prospective drilling in the Eagle Ford formation in East Texas. The Company plans to operate an average of 3 rigs and spud 40 to 50 gross operated wells in 2014. In 2014, the company plans to drill wells with an average lateral length of 7,500 feet, as tests continue to determine the most efficient completion design. In 2013, the company found there was a direct correlation between lateral length to EUR for wells completed with a sufficient volume of proppant. Halcón operated an average of four rigs in El Halcón during the fourth quarter, spudded 13 wells and put 9 wells online. The company produced an average of 7,138 boe/d in El Halcón during the fourth quarter. That's an increase of 43% over the third-quarter of 2013.